In the Hebrew scriptures intercession was the role of the prophets and priests. This is a lofty position and a wonderful place to be. But YHWH wants us even closer. However, there’s an elephant in the room: His pure and absolute holiness versus our sinfulness that comes from living in a fallen world. Even our best living cannot measure up to His holiness. 1. 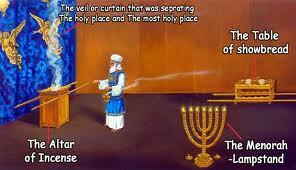 In the tabernacle, God instructed Moses to put a thick, heavy curtain behind the Altar of Incense, between the Holy Place where the priests ministered every day, and the Most Holy Place where His holy presence dwelt (Exodus 26:31-33). In Hebrew the word curtain or veil means to hide or shield. This curtain was 15’ high and 4” thick. You couldn’t miss it; it would not be waving in the wind; you couldn’t accidentally glimpse inside the Most Holy Place. There was no chance of the boundary to the Most Holy Place being mistaken. This curtain hid sinful man from God’s eyes and shielded man from God’s holiness. This curtain was for the protection of the priests. Today, because Yeshua is our high priest, He is our mediator, our intercessor whose righteousness removes our sinfulness from the eyes of YHWH. When He looks at us, He sees Yeshua’s righteousness. Once again we see YHWH, the creator of the universe, finding ways to remove the separation between Himself and us, so that we can come closer and closer to Him. He calls us to join him even in the Most Holy Place – a place where the kings and prophets of Israel could never go, a place where the high priest could go only once a year. Today the curtain continues to remind us of God’s holiness as we enter into His presence. God has not changed. His holiness is no less now than it was in the tabernacle. What has changed is the great gift God gave us in providing His son as a pure, holy sacrifice, so that we would not die in His presence. Yeshua’s shed blood is the only reason we now enjoy open access to God’s presence. The Holy Place is a great place to be. There we’ve got God’s spirit, His word, and we can participate through intercession. Some people stay there and don’t press through the curtain to the Most Holy place. But what’s behind the curtain? What’s beyond intercession? What’s in store for us if we continue into the Most Holy Place? In the next blog we’ll go behind the curtain. This entry was posted on August 3, 2012 by Administrator. It was filed under Atonement, God's Presence, Holiness, Jesus, Salvation, Sin, Tabernacle, Yeshua and was tagged with 2 Cor 5, Aaron, Altar of Incense, curtain, Especially holy place, exodus 26, Heb 10, Heb 7, high priest, Holy of Holies, Holy Place, Inside the tabernacle, Intercession, Isaiah 64, Lev 16, mediator, Messianic, Mishkan, priestly duties, righteousness, tent of meeting, The Most Holy Place, veil. What a journey into the Tabernacle and one that in all my 64 years have never heard. This was a very special opportunity to read and to begin contemplating as I continue in this journey of life. I look forward to this opportunity and may I continue walking in the way of our Lord.